Distinctive features: Whorls of leaves. Yellow flowers hanging down.  Starflower (Lysimachia borealis) - has small white flowers, not hanging down. Flowers: Summer; Yellow; 6 parts (petals); Yellow, small, hanging down. Usually only a few per palnt. Leaves: Simple (smooth-edged), in one or more whorls. Habitat: Forests; Open woods and forest. It doesn't like a lot of light, but neither does it like to grow in deep shade. Uses: The tubers (roots) are edible raw. They taste somewhat like cucumber. It's not overly common, so please only harvest it where it is plentiful. Edible: Roots are edible raw or cooked. Taste like cucumber. However, they are very small. Photography notes: The flowers are sometimes tough to photograph as they are usually draped with spider webs! Photographs: 149 photographs available, of which 10 are featured on this page. SCROLL DOWN FOR PHOTOGRAPHS. The yellow flowers. They normally hang down but when they first start to bloom, the flowers are still pointing somewhat up. 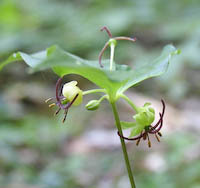 Closer view of a single flower. 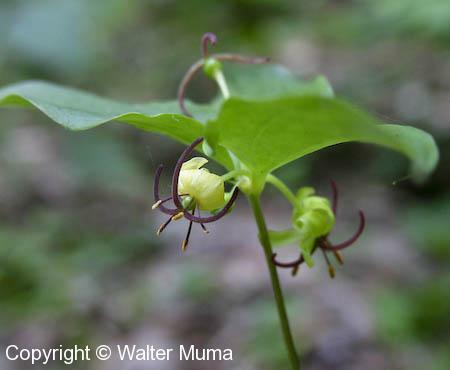 Indian Cucumber Root flowers are quite beautiful. Notice the spider webs. 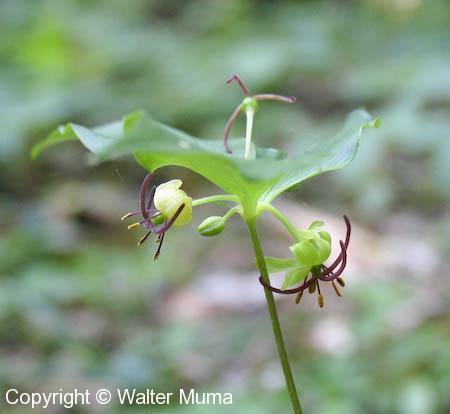 Indian Cucumber Root flwoers are frequently draped with these. 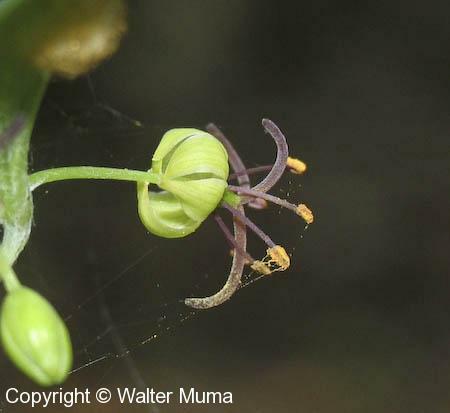 A Indian Cucumber Root flower with misshapen stamens. 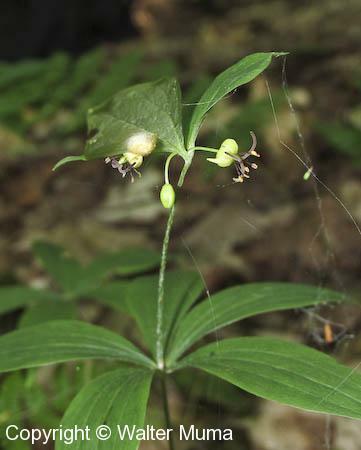 Indian Cucumber Root normally grows to about 8-16" tall. 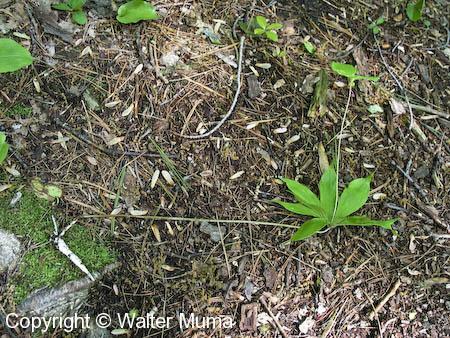 Here is a photo of a complete plant (pulled from the ground). The tuberous root is at the lower left, the top of the plant is at the upper right. Note that this plant has grown crooked. Normally the stalk is straight. 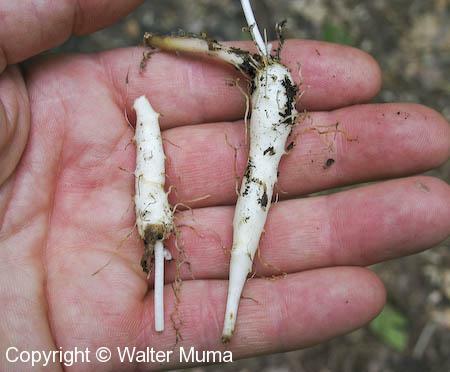 The edible part of Indian Cucumber Root: the roots. They may be eaten raw or cooked like root vegetables. They don't require very much cooking. Eaten raw, they have a very fresh taste, like a very refined cucumber. Ripe Indian Cucumber Root fruit in mid-September.